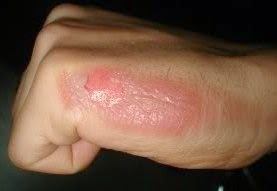 What Causes Burns And Scalds? A burn is caused by dry heat. This can be caused by an iron or fire, for example. A scald is caused by something wet, hot fluids such as hot water or steam. Direct heat - flames, hot surfaces such as iron, hot liquids or gases. Electrical - faulty wiring, old plugs, lightning. Chemical - strong acids or alkalis, cleaning fluids, old batteries. There may be obvious and immediate damage to the skin, which can be very painful. With partial thickness burns, the skin may be pink, red or mottled. Blistering may also be seen. With full thickness burns, the top layer of skin is destroyed and may look white or black, and charred. Full thickness burns are painless, as the nerves carrying pain signals have been destroyed. Burns are common among young children. Scalds are particularly common among toddlers, who are energetic explorers with little sense of potential danger - knocking over hot cups of tea, grabbing at pans on the cooker or getting into hot baths. Cool small burns immediately under cold running water for at least ten minutes. Rinse chemical burns for 20 minutes. Briefly rinse larger burns, avoiding excessive cooling. Remove clothes in the area of the burn where possible, without causing further damage to the skin. Then either wrap the burned area in a clean clear plastic bag or place a clean smooth material, such as cling film, over the burn to prevent infection. Minor burns can be treated at home with painkillers and sterile dressings (don't pop blisters). Deep or extensive burns, or burns to the face, hands or across joints, need to be assessed and treated in hospital. The extent of burns can be estimated using special charts. More than ten per cent burns need hospital treatment (including intravenous fluids). Burns to more than 50 per cent of the body's surface carry a poor chance of survival. Severe burns need specialised long-term management, which may include skin grafts or treatments to prevent contractures, as well as psychological support to deal with scarring. Prevent burns from happening by making your home safe. For example, install smoke detectors, check wiring and remove chemicals.